OnPoint and our customers continue to receive industry recognition for our solutions and designs garnering a half dozen awards in Q4 2016. These awards included two Gold Awards in Excellence in Technology from Brand Hall Group, highlighting OnPoint's mobile sales training and performance. 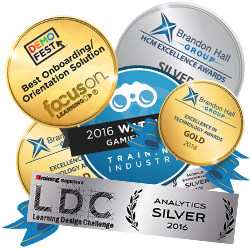 Additionally, OnPoint was recognized for DevLearn DemoFest Best Onboarding Solution and TrainingIndustry.com's Gamification WatchList'16. Finally, Training Magazine humbles us with two Learning Design Challenge '16 Learning Analytics & Mobile Awards. It has been a busy year for OnPoint, and we strive to continue to please our customers and the industry with our passion for creating the best eLearning experiences. Take a look at our Awards page to see what we have won in the past.